In July 2004 Intel introduced the 900 chipset series as a faster and technologically more advanced alternative to the venerable 800 series. These two chipset families are currently the “core-logic” for almost all desktop and workstation motherboards sold for Pentium 4 processors. 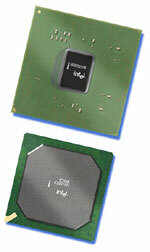 As usual for Intel chipset families the 900 series comes with a wide range of variations for different user groups. The 925X chipset as the fastest variation is targeting power users with high-end systems, while the 915P, 915G and 915V chipsets are for mainstream and budget users, some of them with integrated graphic cores. All variations of the 900 chipset series are complemented by a new “Input/Output Controller Hub”, the ICH6. The 900 chipset series is providing new technology to desktop computing such as PCI-Express, 8-channel high-quality sound and Matrix RAID. Intel has now added extra spice to their 900 chipset by introducing the 925XE variation as an additional choice for power users. The 925XE is the first Intel chipset supporting a quad-pumped (4x266 MHz) system bus frequency of 1066 MHz. At the same, Intel released a matching processor: an Extreme Edition Pentium 4 clocked at 14x266 MHz = 3.46 GHz. Before we examine the performance of the 925XE chipset and the 3.46 GHz EE processor, we will have a short look at the main features and improvements of the 925X/925XE chipsets in comparison to its predecessor. All together we will cover 3 subjects in this article: the new 925XE chipset, the new 3.46 GHz Extreme Edition CPU and Intel’s just released 925XE-based mainboard. This will be a long read with many pictures and graphs. The impatient reader is advised to jump to “Summary, Conclusions and Recommendations”. The 875P MCH and the 925X MCH are both communicating with a maximum bandwidth of 6.4 GB/sec with the CPU. This is an optimal situation for an 875P chipset based system, because the 6.4 GB/sec bandwidth between CPU and MCH are perfectly matching the 6.4 GB/sec bandwidth between MCH and DDR 400 system memory running in dual channel mode. However: The 925X MCH is running with DDR 533 memory. It provides in dual channel mode a bandwidth of 8.53 GB/sec. The 925X MCH is therefore “asynchronously” communicating with the processor on one hand and the system memory on the other. To put it in a picture: Processor and system memory are “out of step” resulting in a less than optimal performance environment. Exactly this problem has been addressed with the 925XE chipset. The 875P and 925X MCH are both supporting only an 800 MHz system bus frequency. The 925XE MCH supports a system bus frequency of 1066 MHz. This is boosting the maximum bandwidth between processor and memory controller from 6.4 GB/sec to 8.53 GB/sec and thereby matching the bandwidth between MCH and system memory. Another, less important improvement is that the 925XE MCH supports now DDR 533 with a lower (which is better) latency of CL 3. The 925X chipset has “official” support only for DDR 533 with the higher latency of CL 4. The 925X and 925XE are both supporting “Extended Memory 64 Technology” (EM64T) which provides 64-bit memory addressability for future 64-bit desktop computing. Selected Prescott core based versions of the Pentium 4 processor have EM64T capability already enabled. The 900 chipset series is complemented by the also new ICH6-R (Input/Output Controller Hub). The ICH6, like the previous ICH5, is available with RAID capability, denoted by the “R” moniker. Many of the improvements the 900 series offers in comparison to the preceding 800 series are by virtue of the ICH6. Intel’s 9x5 chipset series is the first chipset replacing the PCI interface with PCI Express (in short PCI-E). Its major advantage is much higher bandwidth and multiple scalability lanes. PCI Express architecture provides a high performance I/O infrastructure over a x1 PCI Express lane for Gigabit Ethernet, TV Tuners, 1394a/b controllers and general purpose I/O. x1 PCI Express offers for these devices concurrently 500 MB/s, which is up to 3.5 times more bandwidth than with PCI at 133 MB/s. At the same time the AGP interface is replaced by PCI Express x16 graphics which delivers up to 4 GB/s per direction for up to 3.5 times more bandwidth than AGP8X. The ICH6 also features 8-channel “Intel High Definition Sound”. This new codec is capable of playing back more channels at higher quality than previous integrated audio solutions. When AC'97 was developed, users were typically listening to music and movies with stereo sound. With the success of DVD movies encoded with Dolby Digital and DTS multi-channel audio formats, listening in full surround sound with anywhere from six to eight speakers has become common. Intel HD Audio, based on the new Realtek ALC 880 codec, is capable of delivering the support and sound quality for up to eight channels at 192 kHz/32-bit quality. The AC'97 codec only supports six channels at 48 kHz/20-bit. HD Audio is supporting all Dolby technologies, including the latest Dolby Pro Logic IIx, which makes it possible to enjoy older stereo content in 7.1 channel surround sound. HD Audio also features multi-streaming capabilities that give users the ability to send two or more different audio streams to different places at the same time. It is for example possible to send a game's sound through 5.1 speakers while the Internet chatting audio is sent through the headset - or to send a DVD movie with 5.1 audio to a surround sound system in the living room, while listening to digital music and surfing the Web on the PC. For more detail on the differences between 925X, 925XE and 875P, see the table above.